Connectik is a company that provides various collaboration means to companies stay connected with customers and their employees. They offer various solutions to keep your company projects productive and all your efforts coordinated. The company brought me in for a series of headshots as well as some incidental shots to be used on their website and print material. The company allows you to connect with coworkers in one-on-one or team conversations through secure live chat. Seamlessly integrate multiple devices with universal and user-friendly interface. Efficiently connect with those whose projects & interests are aligned with yours by creating and joining private teams. Break down walls, open dialogue and promote teamwork. Create and join teams, set up events, facilitate projects, assign tasks and securely share any file with your peers and guests. Privacy has never been more important than in today’s connected world. Connectik was founded with security in mind. Share files, chat, and collaborate with your peers without sacrificing your peace of mind. 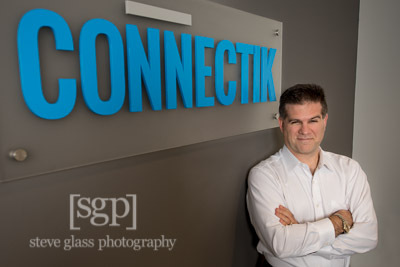 Corporate headshots are one of the most important things you can do for you company and your career. Like it or not, we all have a digital footprint. LinkedIn, Facebook, Twitter, Instagram, company websites, resumes etc... The applications are endless. You have just seconds to make an impression and that's what a great headshot is about, making a great first impression. A headshot need not be a laborious process. You can bring me in to shoot your staff and save a good deal of money and time by having it done at your location. Very often the company will want "internal stock" shot. These incidental or semi-staged shots can be used in collateral, annual reports, or other printed or internet needs you might have.